At NTUU KPI post-graduates are part of a strong and international post-graduate community. Being accepted for a post-graduate course at NTUU KPI is an evidence of previous academic excellence, and future potential. 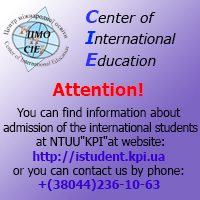 We seek applications from excellent students with all kinds of backgrounds. The following list of phrases and their definitions might help you understand the mysterious language of science. These special phrases are also applicable to anyone working on a Ph.D. dissertation or academic paper! - "It has long been known"... I didn't look up the original reference. - "A definite trend is evident"... These data are practically meaningless. - "While it has not been possible to provide definite answers to the questions"... An unsuccessful experiment, but I still hope to get it published. - "Three of the samples were chosen for detailed study"... The other results didn't make any sense. - "Typical results are shown"... This is the prettiest graph. - "These results will be in a subsequent report"... I might get around to this sometime, if pushed/funded. - "In my experience"... once. - "In case after case"... twice. - "In a series of cases"... thrice. - "It is believed that"... I think. - "It is generally believed that"... A couple of others think so, too. - "It is clear that much additional work will be required before a complete understanding of this phenomenon occurs"... I don’t understand it. - "After additional study by my colleagues"... They don't understand it either. - "Thanks are due to John for assistance with the experiment and to Mike for valuable discussions"... John did the work and Mike explained to me what it meant. - "A highly significant area for exploratory study"... A totally useless topic selected by committee.